If you want to get away from the hustle and bustle of daily life, Hoang Su Phi, located in an untouchable Northeast Vietnam, is definitely the best place for you who are a mountain lover, a trekking Vietnam enthusiast or a cultural explorer. With a stunning natural attraction, a diverse hill tribe minority culture, and a winding trekking path, this place is worth for your money and your time which you decide to spend for exploring this remote spot. Ensured that after trekking Hoang Su Phi, you will never regret your choice and never forget a wonderful memory gained along this trekking trips. Trekking through a curved route that is surrounded by a magnificent mountainous view, an astonishing terraced field, and the extraordinary hill tribe village, you will definitely fall in love with the beauty of Northern Vietnam’s nature, the fresh mountain air and the peaceful pace of the local daily life. All things help you to calm your nerves, to fill up yourself with a full of new positive energy. Moreover, undoubtedly, experiencing the local culture of ethnic minorities, tasting a warm meal with local people, sleeping at cozy homestay will be the awesome moments that you never gain any elsewhere in the world. 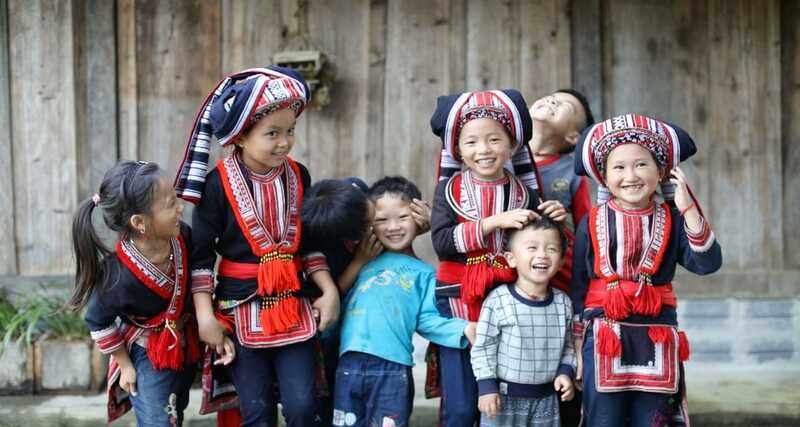 Located in Northeast Vietnam, Hoang Su Phi is famous for the stunning rice terrace field, recognized as National heritage, the authentic culture of ethnic minority groups and the awesome trekking Vietnam trail. As a remote rural area of Ha Gang province, this spot remains the rustic beauty of Northern mountainous nature, the vibrant flora, and fauna which are specially represented for the tropical country. For trekkers, definitely, you will be satisfied by the dramatic trails which wind along the lush mountain passes, offering the amazing panoramic views of the colorful valley below, the cascading endless rice terraces and the tiny hill-tribe villages. Furthermore, with the diverse terrains, you have chances to challenge yourself from easy, moderate to difficult trekking Vietnam level in different topography such as landside, meadow, boulders, rocky and muddy ground. Besides the incredible mountain charm of this unspoiled spot, Hoang Su Phi has an irresistible mystical allure for you who yearn for the hill-tribe lifestyle. As the varied hill-tribe people have been lived in this district, you will chance to witness the different local houses that contain different architecture as well as the different stories and customs behind. Another huge draw is that you have the great opportunity to pass through the impressive old green tea plantation which is considered as one of the main income source of hill-tribe people lived in there. Old tea tree, called Shan tea, which have been grown more than one hundred years. It is incredible if you witness it with your own eyes. Ensured that you will be surprised by how huge green old tree is. Hill tribe ethnic minorities are one of the special things in this region. It offers you a new angle of Vietnamese culture. Vietnam, known as a multiethnic country, has fifty-four ethnic groups. Along with trekking Hoang Su Phi trip, you get to know at least three of them well, specified Red Dzao, H’mong and Tay. After three to six days trekking and living in this mountains region with local people, without doubt that you can understand about the different characters of each hill-tribe very well. For instance, the first thing to differ H’mong, Tay and Red Dao is their cloth. The Red Dao’s cloth is more colorful than others that they used to wear the indigo color. 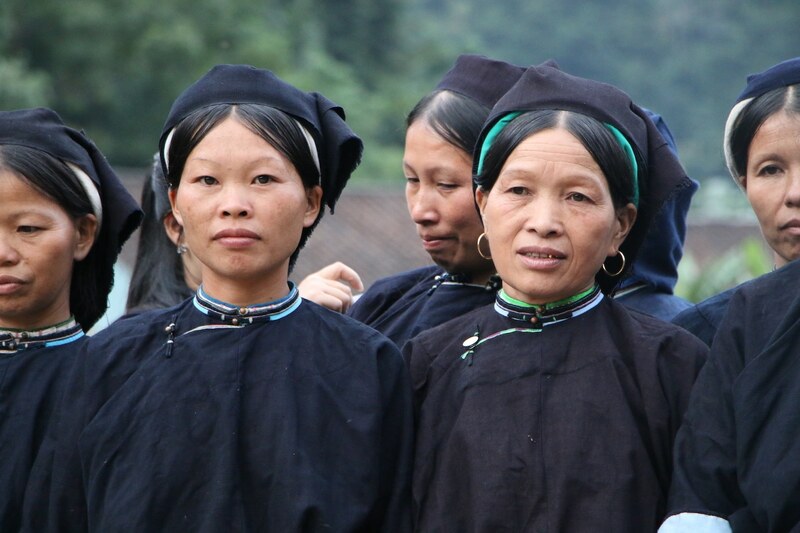 The second thing that can differ is the way they wear such as the H’mong wear the indigo turban while Red Dao people wear the red triangular shaped turban. Experiencing the daily routine of local inhabitants such as a farming practice: cultivate or harvest rice, tree vegetable, and fruit, an embroidery – learned to embroider pattern, or learned how to make an iron tool like a local blacksmith, will be a fascinated moment. Last but not least, it is so regretful if you do not taste the amazing hill-tribe cuisine such as Thang Co, mouse meat, sticky rice, and corn wine. It is very unusual food and brings you an unforgettable experience. While you eat, you can witness the cultural performances such as traditional fire dance, spiritual traditional story, and the hill-tribe song.